On April 28th middle school students will share their hard work and discoveries in a science exhibition, to which the Lincoln community is invited. Students were given the challenge of exploring any subject that they are interested in, through the scientific method. They designed experiments to test their hypotheses, gathered and analyzed their data for patterns and sources of error, and formed a conclusion that answered their questions. The student scientists have explored questions relating to a really amazing range of topics, including: learning and distractions, impact of video games on many mental processes, choice blindness, color and attention, reaction to frustration, exercise physiology, stress and heart rate, self-esteem and peer pressure, bacterial filtering plants, solar engineering, air quality in Kathmandu, headphones and hearing damage, e- readers and reading speed. 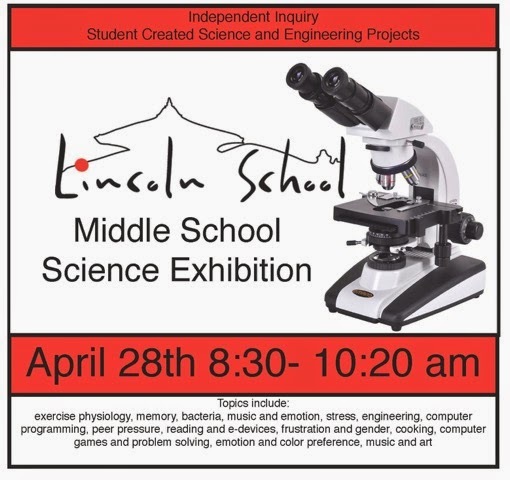 All members of the community are invited to come and learn from our student scientists. The exhibition will take place from 8:30- 10:20 am in the middle and high school science labs.